René Koiter is a video game geek who likes to occasionally dress up as fictional characters, and the cover model of the new Heroes vs Villains calendar project! He is also a graphic designer for Blizzard. 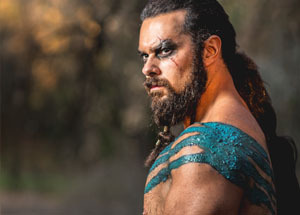 He entered the cosplay scene as Jim Raynor (Starcraft series), but is now well-renowned for his portrayal of Khal Drogo from Game of Thrones, a cosplay that took him months to build his incredible muscle mass for. Clint began his foray into the costuming universe with the 501st in 2010. Since then he's built and sold all manner of costumes, and is a distributor for a popular fan sculpt Storm Trooper armor kit. Bonding with other costuming enthusiasts lead Clint branching out to other fandoms, collecting friends and prop building skills along the way. 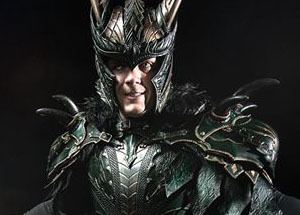 Most recently, he has worked with Samuel Lee of Prince Armory to create Medieval Loki. 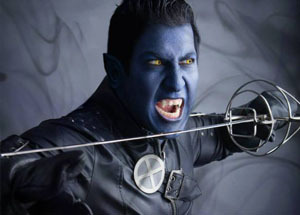 As an avid reader he is inspired by anything sci-fi, medieval, or comic book related. Outside of costuming, Clint is a police officer and the father of two boys, who share their father's love for costuming. Woody has been a professional costumer for only a year, but has already been dubbed "The Nightcrawler of Houston." He began with smaller cosplays with Shay of Woody and Shay Cosplay at the Texas Renaissance Festival in Plantersville, TX and has since expanded to comic and anime conventions. He is an avid martial artist and gaming buff who works full time as in IT coordinator for BASF. Jordan is a full-time prop maker, cosplayer, and an aspiring makeup & effects artist - currently based out of Toronto, Canada. His prop and costume work has been featured on Sourcefed, Kotaku, io9, and others - in addition to being recognized by creators such as Warner Bros and 2k Games. Jordan attends conventions throughout North America – and always loves meeting new people in the community! Steven K Smith is a freelance illustrator turned prop maker based outside of Kansas City Missouri. Steven started his prop building and cosplaying career at the end of 2012 and hasn't looked back. 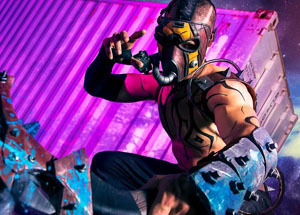 He is best known worldwide for his highly detailed Borderlands psycho masks and their iconic weapons. 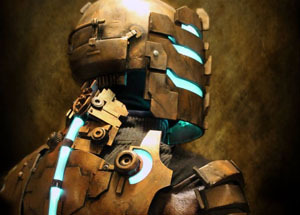 He is also known for his dragon helm from the highly anticipated video game Dragon Age: Inquisition, and the Dead Space Level 3 suit. Both have won numerous awards and are featured on several cosplay and video game based sites. Andy Valentine (Valentine Cosplay) is a cosplayer and prop maker based out of Bristol in the UK. With a deep and long-term love of gaming, Andy favors cosplaying video game characters, and most enjoys the darker and twisted villains of various gaming genres. If it involves mud, blood and scars, he's all over it. 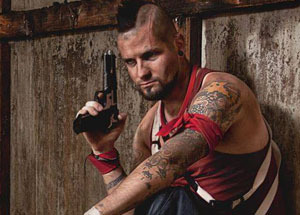 Professionally, he spends his days making replica props and bringing weapons and costumes from the screen to life. He has a constantly painty, resiny odour, and if something in the house isn't covered in paint, it's covered in cat hair. Todd has a long history of interest in video games, comic books, and movies. He's a film school graduate and a Production Assistant for a Visual Effects Company by day, and a freelance videographer and cosplayer by night. He's an active member of the Ghostbusters of British Columbia, and always looks to grow his cosplay skills with each new project. Josh is an avid gamer and fanboy of all things Star Wars and BioWare. 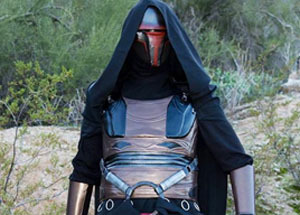 He took his first steps into the larger world of cosplay when he joined the 501st out of a desire to use his love of costuming to benefit people like his father, who was diagnosed with Multiple Sclerosis. 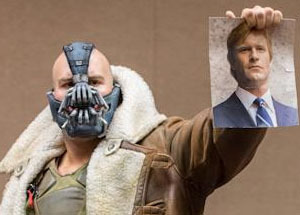 He now teams up with his trusty sidekick/wife to bring his favorite heroes (and villains) to life. Ryan's costume adventure started in 2005 when he took his Halloween obsession and turned it into a full blown Hobby. Having costumed everything from Darth Maul from Star Wars to Blain (Jesse Ventura) from Predator, he enjoys creating the illusion with his costumes that you are looking at the real character. He also enjoys other hobbies such as Slowpitch softball, Airsoft and Auto racing. Ryan and his wife Ashley reside in Chandler, Arizona with their 5 cats. The Villain of Cosplay, Jonny Ruckus is a graphic designer who's been prop building and costuming for nearly 5 years. The self proclaimed "Best in the World" has been convention and raising money for charities with The Ghostbusters of New Hampshire all over the east coast, but got internet notoriety with his sarcastic attitude and the "Hello Kitty" Proton Pack. 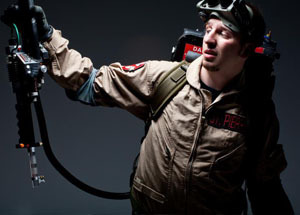 Not just a Ghostbuster, Jonny is known for his Louis Vuitton Storm Trooper and as Ash from Evil Dead II. The Daywalker is a Coslife and professional Cosplayer based in London, and acts as a real life personification of Blade, creating the impression of the character walking off the screen straight onto the floor of a convention. He's made many guest appearances at various conventions. 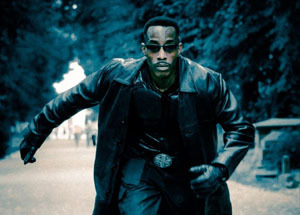 The Daywalker is also a professional martial artist (Taekwondo - studies under the Frank & Jeff Massar Taekwondo Association) and a professional stunt fight coordinator, choreographer and professional Blade look-a-like and stuntman. Ryan Ricks is a former jeweler that now creates replica props. He started cosplaying and building props four years ago when he created his first Chewbacca. Going to sci-fi and comic book conventions and debuting his latest creations is now a big part of his life. 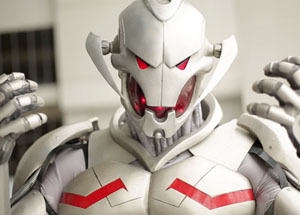 Ultron was completed for DragonCon 2013 and instantly became a big hit. Between being a stay-at-home dad and building props, Ryan is busy but he looks forward to each new build with enthusiasm.